This is the second time I have shared a recipe from a Jeff Smith cookbook. He was well-known in the USA in the 1980s and 90s presenting 261 television episodes and 10 cookbooks. He fell from grace and public life when seven men accused him of sexual assault. No criminal charges were laid and Smith’s insurers settled the cases for an undisclosed amount in 1998. The first two page 32s didn’t have recipes, so I moved on to page 232. 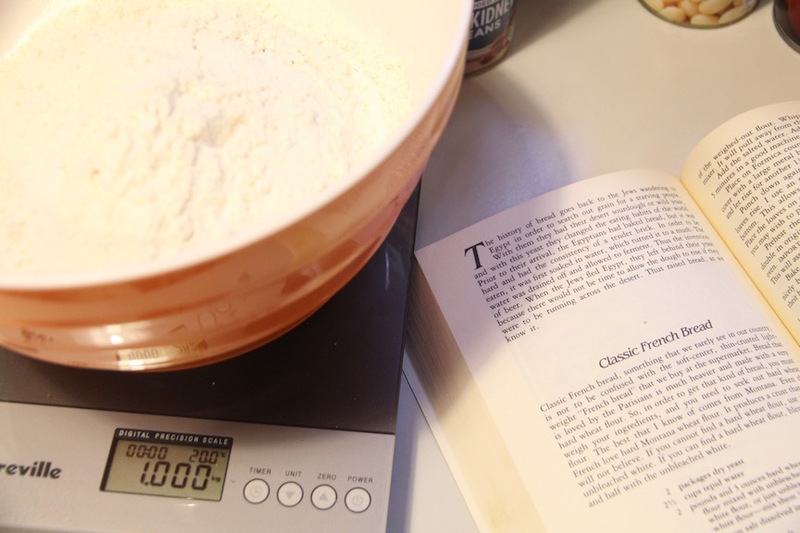 Smith introduces the recipe by explaining the benefit of using a hard wheat (baker’s) flour. Dissolve the yeast in the water. (Tepid: not hot, not cool, but barely warm.) Let stand for 5 minutes. Stir to dissolve. 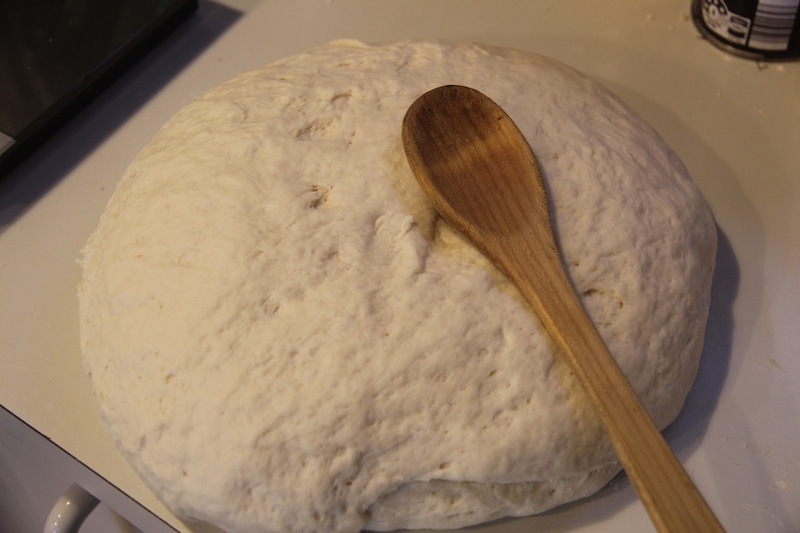 Make a sponge of the water and yeast, together with 4 cups of the weighed out flour. Whip for 10 minutes with an electric mixer. It will pull away from the side of the mixing bowl. Add the salted water. 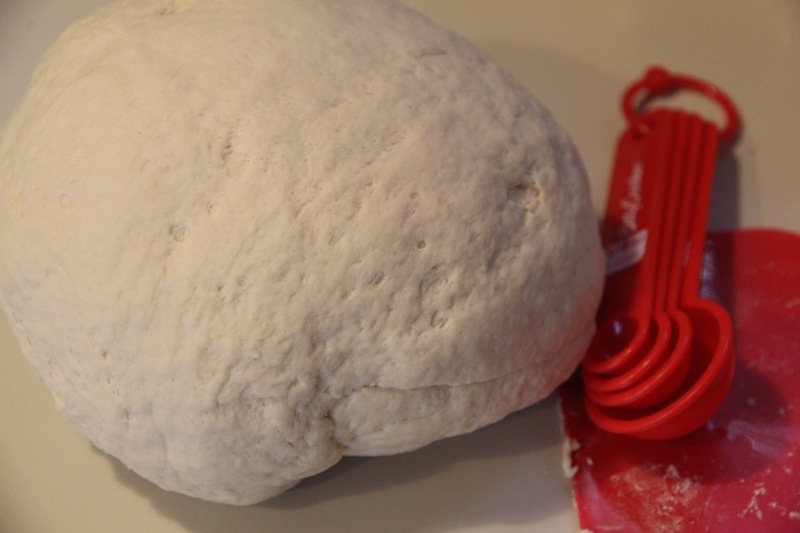 Add the remaining flour and knead for 5 minutes in a good machine, or 15 minutes by hand. Place on Formica counter, or on a piece of plastic wrap, and cover with a large metal bowl. Let rise for 2 hours. Punch down, and let rise for another 1 1/2 hours. Punch down again, and mlld into 3 or 4 loaves. Let the loaves rise. I do this in an extra oven with a pan of hot water in the bottom. 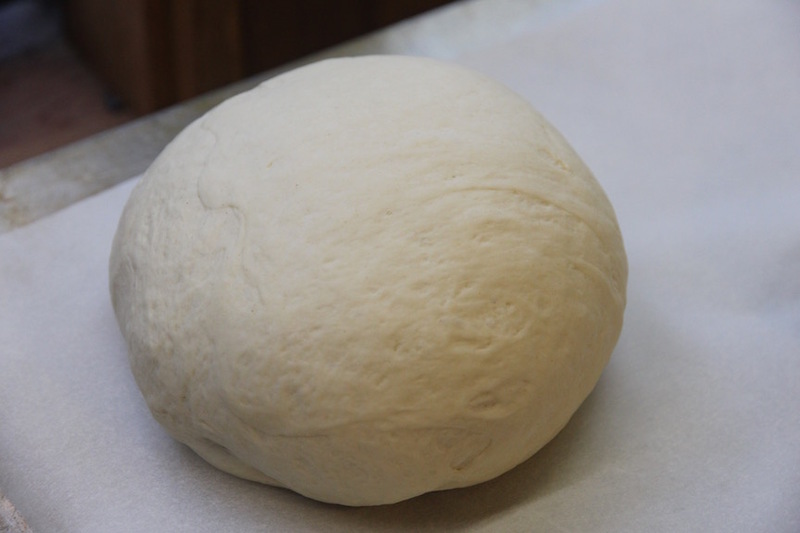 This allow for steam heat, perfect for raising dough. Place the loaves on a greased baking sheet before letting them rise: you may wish to place cornmeal on the greased baking sheet. Preheat the oven to 450°F. When the loaves have risen to double in original bulk, place them in the upper one-third of the over. Important: Place a pan of hot water on the bottom shelf. This will assure you of a great crust. Bake in the oven for about 25 minutes, or until the bread is nicely browned and the loaves sound hollow when you thump their bottoms with your finger. If you wish an old-world look to your bread, simply dust the loaves with flour before the final rising. You can use an egg and water glaze, but I am convinced that you will get a much better crust if you simply use flour. This bread is so rich that you need not put butter on it. The French rarely eat butter on bread. And if you wish to eliminate both salt and butter, simply cut down on the amount of salt in the recipe. It is tasty without. A few things about this recipe surprised me. This is an Australian edition of the book, so I’d have thought it would show metric (rather than imperial) measurements. So for those of you who rely on metric, the flour is equal to 1 kilo and the oven temperature is 230°C. I also thought it was strange to specify using a paper sack when measuring the flour, and a Formica counter and a metal bowl for letting the dough rise. Oh well, I’ll stop being nit-picky. I did follow most of the recipe. 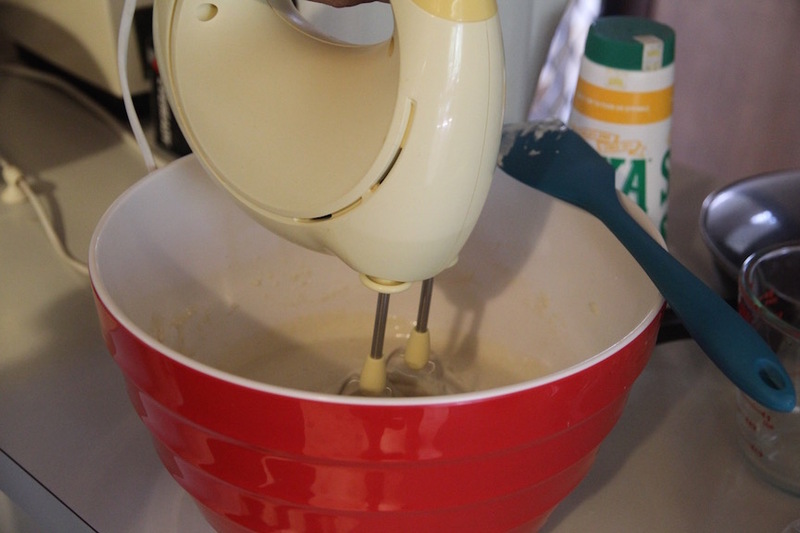 I found that not only did the dough come away from the sides of the bowl while being whipped with the electric mixer, it also crawled up the spindles of the mixer. So I had to constantly scrape it down. There was only enough dough to make 2 loaves, not the 3 to 4 suggested. I didn’t dust the loaves with flour or use and egg and water glaze, and the 25 minutes cooking time was fine. You can see I did a rather bodgy job of slashing the tops of the loaves. This made a nice enough bread, but I thought it involved a lot more work than necessary. I bake a lot of bread (a minimum of two loaves a week) and can’t remember a time that the recipe has called for 10 minutes of whipping and then 15 minutes of kneading. As an aside, I made this when we had five Scandinavian exchange students staying with us for six days. I made seven or eight loaves of bread that week and these were the most labour intensive loaves of all, without any appreciable difference in taste. That said, it all got eaten. But in future, I’ll stick to my regular recipes. Bread is a mainstay food on our travels. Here’s a post about one of my favourite memories of stumbling upon a small home bakery in Tashkent, Uzbekistan. This entry was posted in Baking, Bread and tagged cornmeal, flour, salt, yeast. Bookmark the permalink. Peggy, it certainly looks very yummy. I used to have a fantasy of being able to make my own bread but I don’t have a breadmaker. And when I look around my kitchen I can’t see anywhere to store one. But good on you! 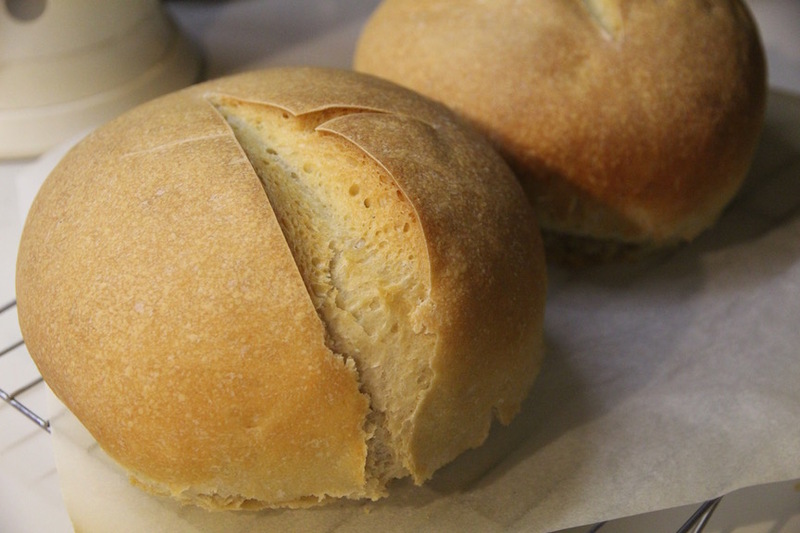 It must be lovely to have fresh, warm bread from the oven. I usually make sourdough, so this was a diversion from the norm. 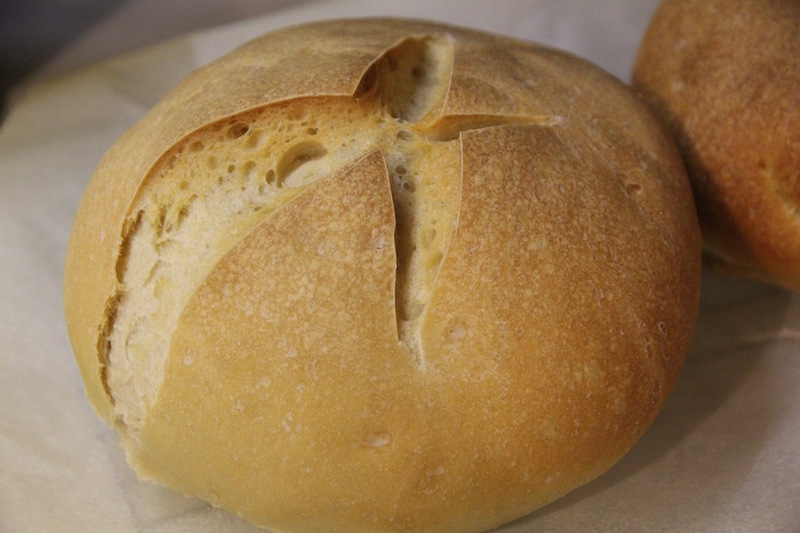 Fresh bread is a real treat, but it slices better if you let it cool a while after it comes out of the oven. Can’t say that I’ve ever tried making bread, but my Mother made a lot of different varieties some 40 years ago with various flours, seeds etc and they were brilliant. I made a sponge when I was a teenager and you couldn’t break it with a hammer, so to attempt bread was not ‘on the menu’ and other than cutting the vegetables for dinner every night back in those days (which I hated), I just couldn’t top my Mother’s country background experience in cooking. There’s an art to making scones. My daughter, Libby, makes great ones. I used to work as a live-in Nanny many moons ago and the children’s Uncle ran the family flour mill. I was lucky enough to score REALLY fresh flour on, or near, the day of milling, which made great scones (and cakes/pastry). Very few would ever be able to enjoy that luxury. Lucky you. We used to have a very large home-made (me) pizza oven which was perfect to make bread in after the oven had cooled down from the pizza baking. It was perfect. Cooking in that large brick oven was a way of life. How we miss that! Still, it is so nice to read your recipes and look at the photos., Peggy. Oh my, I’d love to have a pizza oven in the backyard. I can imagine how much you miss it. On top of the tragic fall of Jeff Smith, he also was a Methodist pastor, if I recall. His program was very entertaining and I felt bad for him and his victims when the scandal came to light. Yes, he was a pastor. I agree that his programs were entertaining. Guess we’ll never know the truth behind the accusations. A lot of people find bread-making scary. Just keep trying. 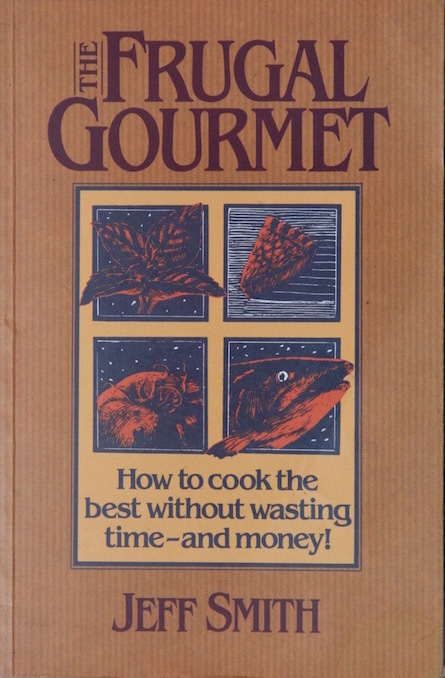 I have 5 of his cook books. You are right about him making things a little too involved. I picked the books up over the years in second hand resale shops for very little. Thanks for sharing. I’m glad you’ve noticed that too. Like you, I’ve bought his books second-hand over the years.